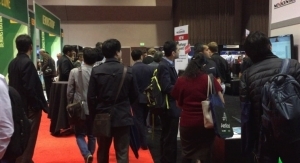 Optomec Demonstrates Production 3D Printing Technology At Printed Electronics USA - The Independent Global Source for the Flexible and Printed Electronics Industry. 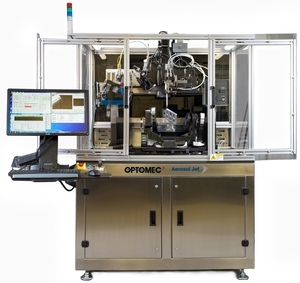 Optomec, a leading global supplier of production grade additive manufacturing systems for 3D printed electronics (Aerosol Jet) and 3D printed metals (LENS) announced that the company will showcase its Aerosol Jet 5X system for production Printed Electronics applications at the IDTechEx conference held Nov. 15-16in Santa Clara, CA. Aerosol Jet 3D printing systems are used for a wide array of printed electronics applications from R&D to high volume manufacturing. Examples of printed electronic devices will be on display in the Optomec booth along with live demonstrations of the five axis Aerosol Jet 5x system for printed electronics. The company will also showcase a groundbreaking 3D printed sensor application that was developed working with its customer General Electric (GE). The production solution utilizes an Aerosol Jet 5X system to print passivesensors directly onto turbine blades used in an industrial gas turbine. The sensors are composed of a ceramic material that can withstand the very high operating temperatures seen in the hot section of the gas turbine. Mike O’Reilly, director of Aerosol Jet Products, will deliver a presentation at the conference titled “Functionalizing Structures via Aerosol Jet 3D Printed Electronics” at 3:20 pm on Wednesday, Nov. 15. O’Reilly will discuss how structural electronics is emerging as a new way of adding intelligence into products such as automobiles, turbine engines, medical devices, and building infrastructure.These functions can be used to sense, report on, and take or recommend corrective actions when products are deviating from their specifications. Optomec Aerosol Jet printers deliver the unique ability to print electronic and other materials onto any type of 2D and 3D structure, in dimensions ranging from 10 microns up to centimeters in scale. Aerosol Jet 3D printed electronics solutions have been deployed to add intelligence to products enabling continuous monitoring and feedback. This added functionality facilitates just-in-time corrective action helping to insure steady state operation of the functionalized products. Real world examples will be presented, including printed creep sensors on turbine blades to monitor metal fatigue; printed temperature sensors onto catheters to insure proper operation of critical arterial ablation procedures; printed strain sensor on rotary shafts providing instantaneous feedback on torque related issues; and printed gas sensors on well-heads for detecting excess methane leakage.